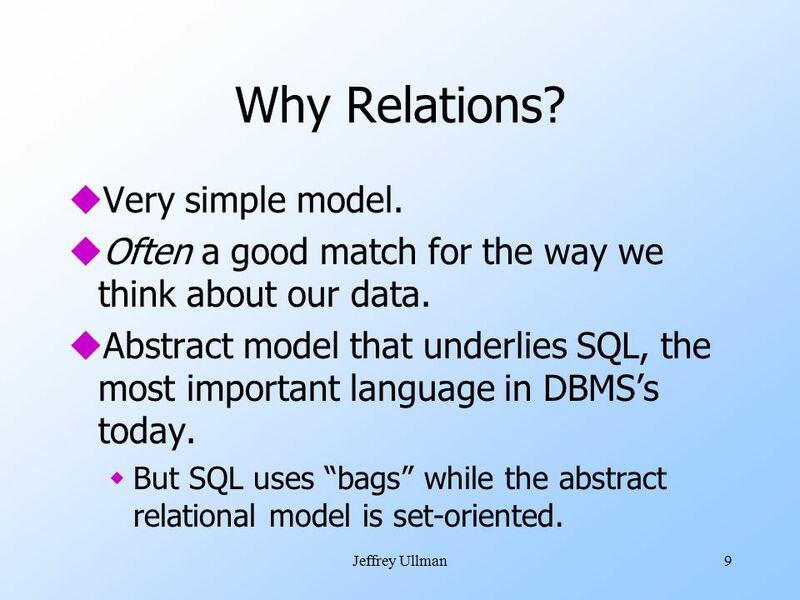 Database Management Systems Chapter 3 The Relational Data Model (I) Instructor: Li Ma Department of Computer Science Texas Southern University, Houston. 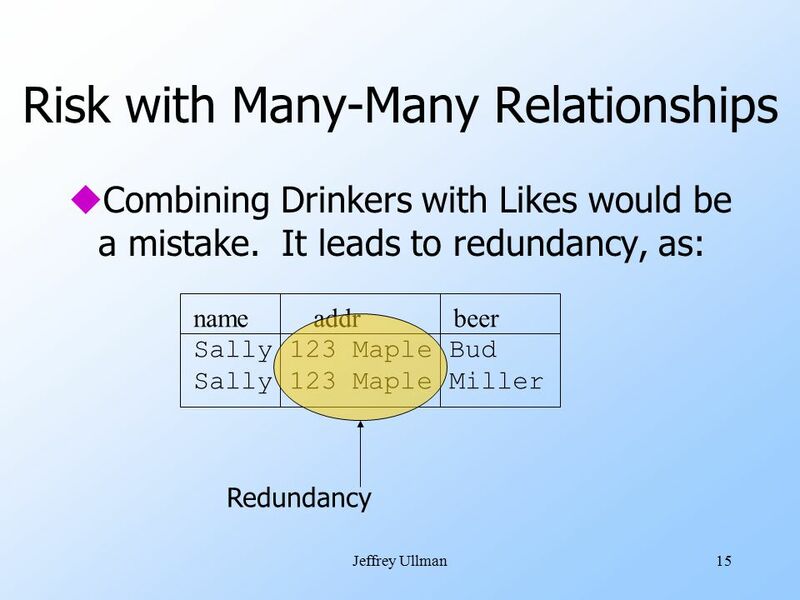 4 Jeffrey Ullman4 Schemas uRelation schema = relation name and attribute list. wOptionally: types of attributes. 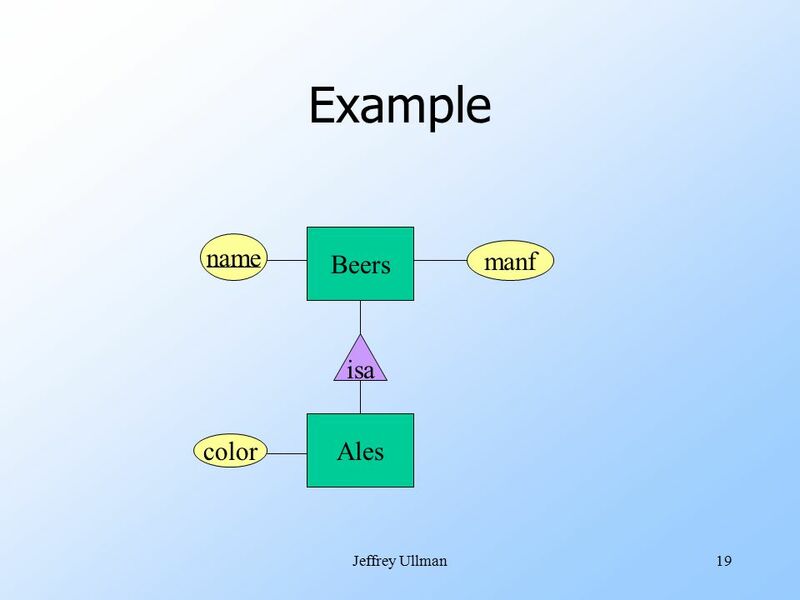 wExample: Beers(name, manf) or Beers(name: string, manf: string) uRelation instance = current set of rows. uDatabase = collection of relations. 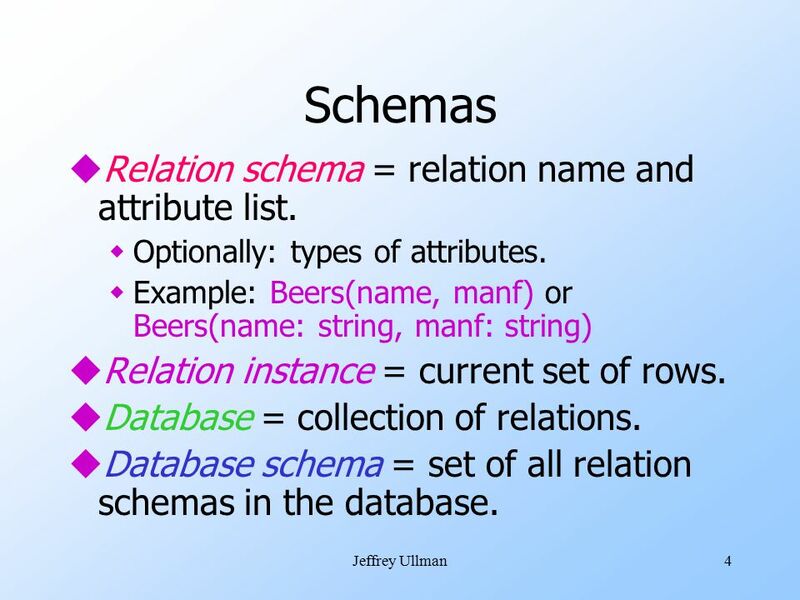 uDatabase schema = set of all relation schemas in the database. 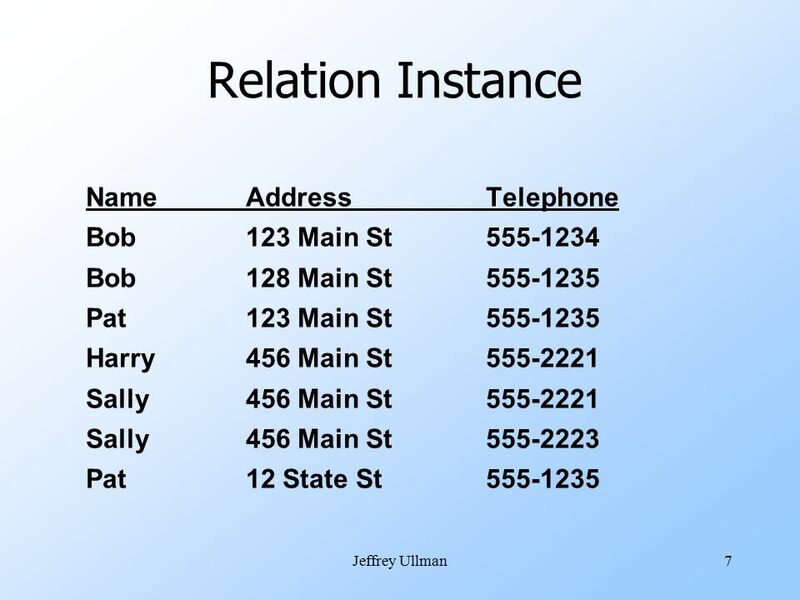 9 Jeffrey Ullman9 Why Relations? uVery simple model. uOften a good match for the way we think about our data. 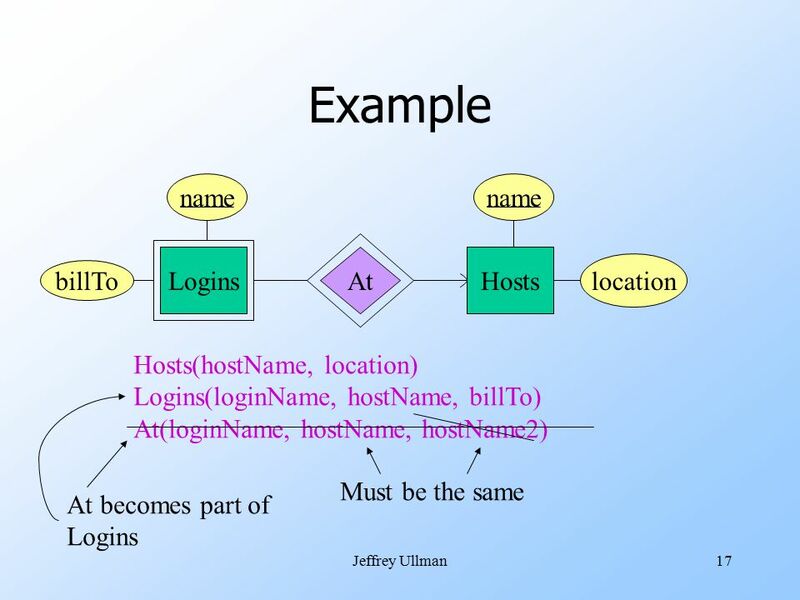 uAbstract model that underlies SQL, the most important language in DBMS’s today. wBut SQL uses “bags” while the abstract relational model is set-oriented. 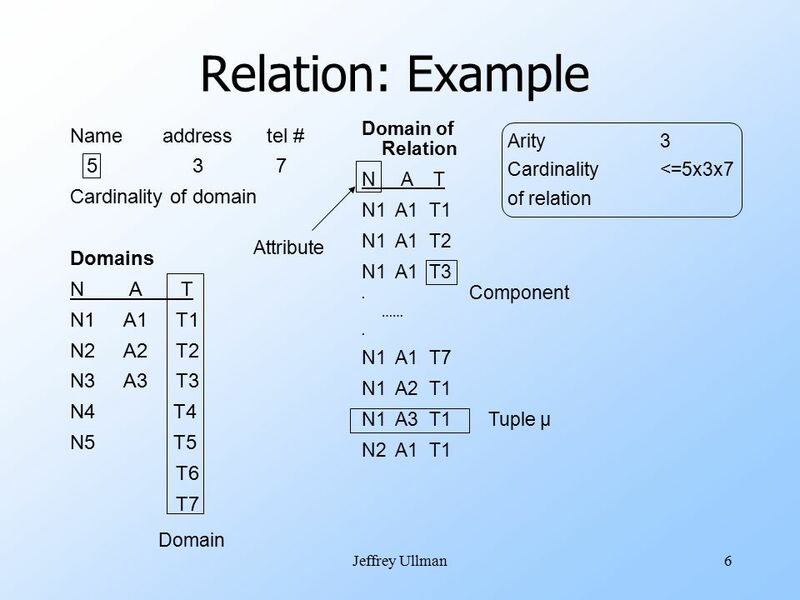 10 Jeffrey Ullman10 From E/R Diagrams to Relations uEntity set -> relation. wAttributes -> attributes. 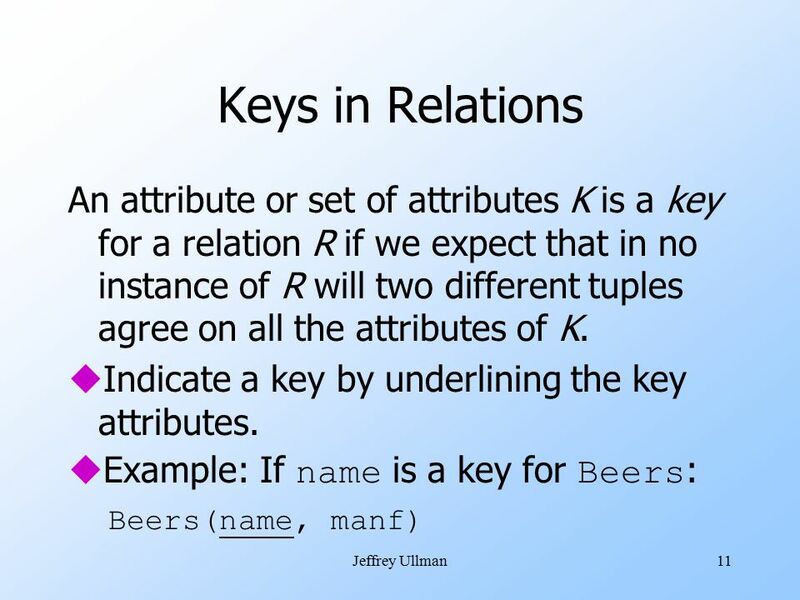 uRelationships -> relations whose attributes are only: wThe keys of the connected entity sets. wAttributes of the relationship itself. 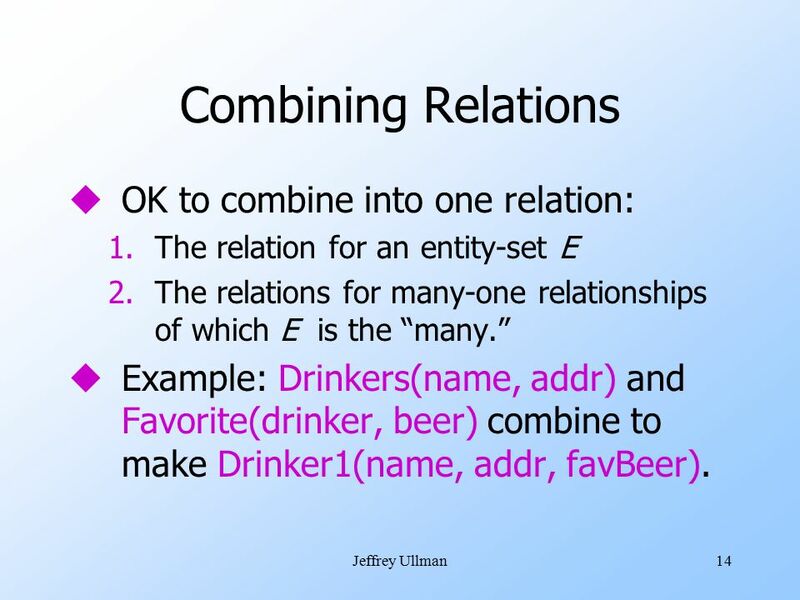 14 Jeffrey Ullman14 Combining Relations uOK to combine into one relation: 1.The relation for an entity-set E 2.The relations for many-one relationships of which E is the “many.” uExample: Drinkers(name, addr) and Favorite(drinker, beer) combine to make Drinker1(name, addr, favBeer). 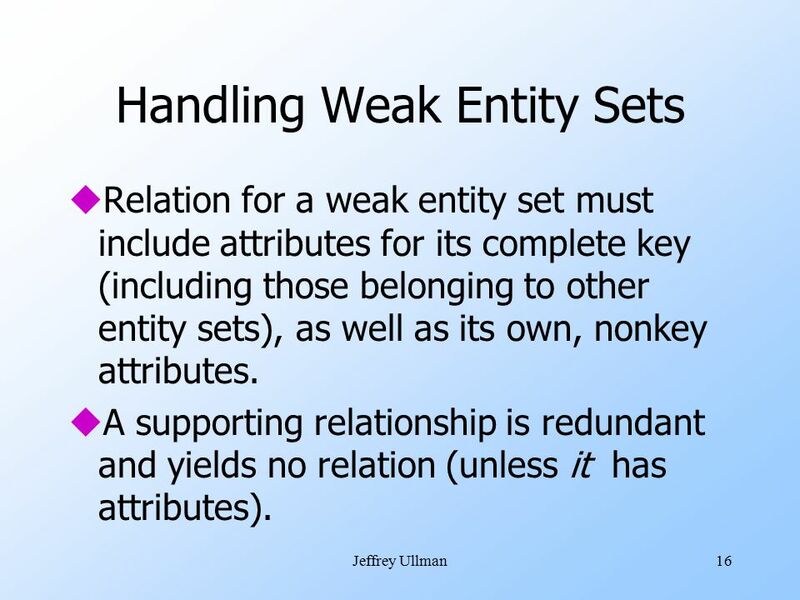 16 Jeffrey Ullman16 Handling Weak Entity Sets uRelation for a weak entity set must include attributes for its complete key (including those belonging to other entity sets), as well as its own, nonkey attributes. uA supporting relationship is redundant and yields no relation (unless it has attributes). 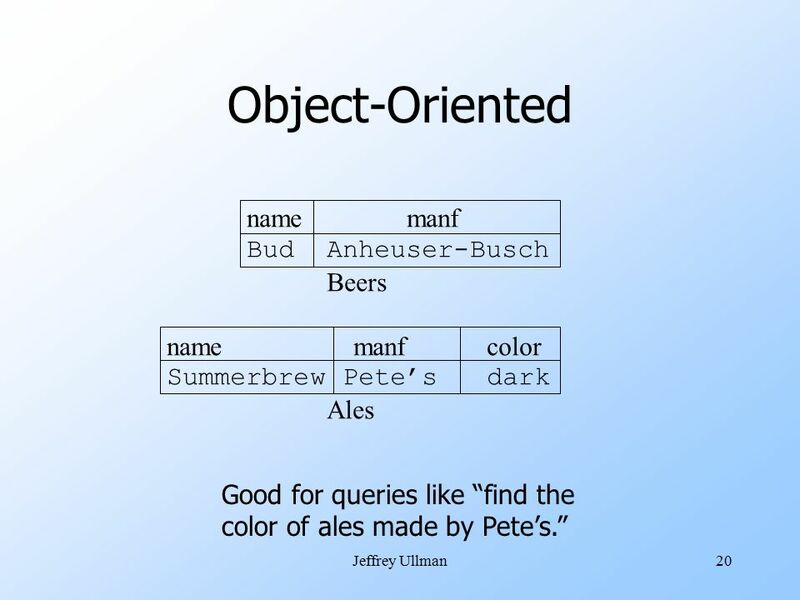 18 Jeffrey Ullman18 Subclasses: Three Approaches 1.Object-oriented : One relation per subset of subclasses, with all relevant attributes. 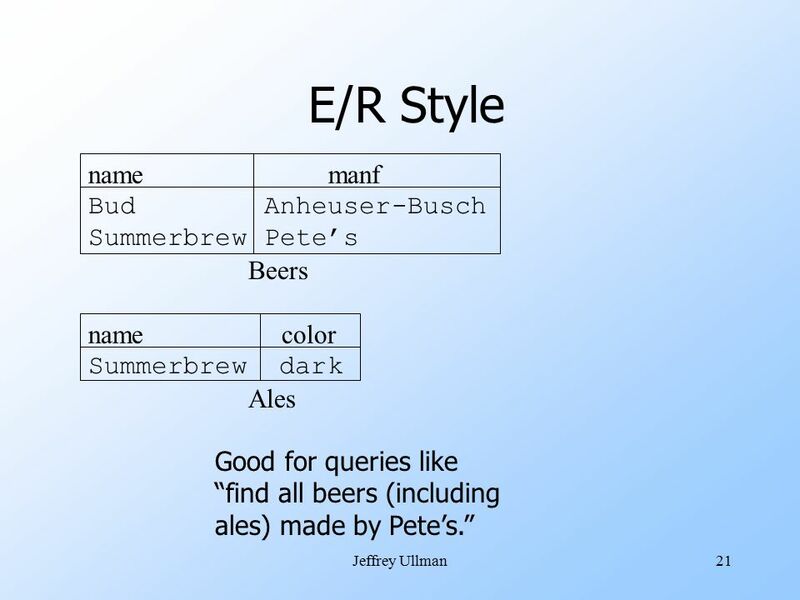 2.E/R style : One relation for each subclass: wKey attribute(s). wAttributes of that subclass. 3.Use nulls : One relation; entities have NULL in attributes that don’t belong to them. 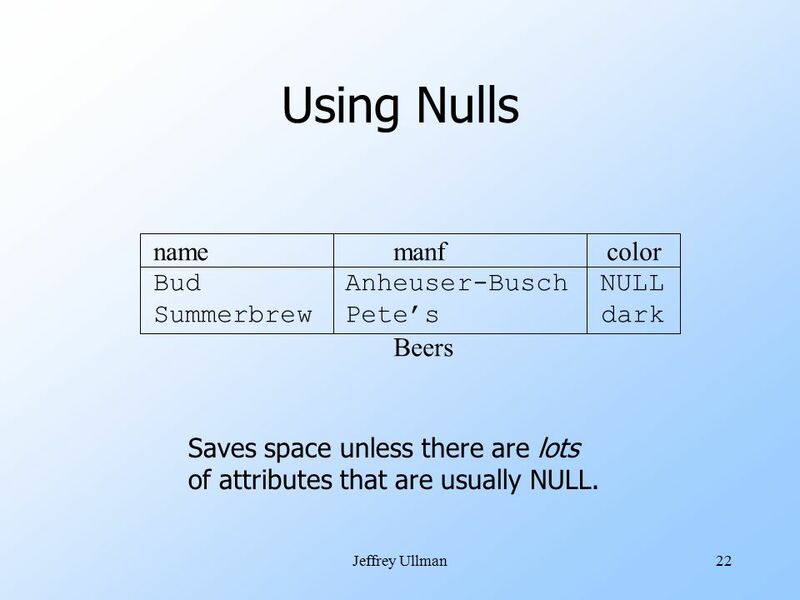 22 Jeffrey Ullman22 Using Nulls namemanf color Bud Anheuser-Busch NULL Summerbrew Pete’s dark Beers Saves space unless there are lots of attributes that are usually NULL. 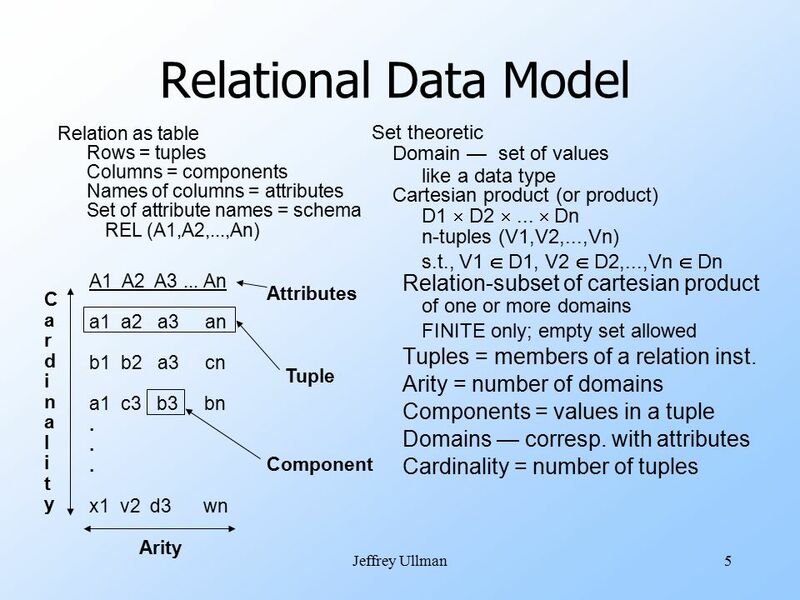 Download ppt "Database Management Systems Chapter 3 The Relational Data Model (I) Instructor: Li Ma Department of Computer Science Texas Southern University, Houston." CS 405G: Introduction to Database Systems Instructor: Jinze Liu Fall 2009. Constraints in Entity-Relationship Models Zaki Malik September 18, 2008. SQL Group Members: Shijun Shen Xia Tang Sixin Qiang. 1 Introduction to SQL Select-From-Where Statements Multirelation Queries Subqueries. SQL Queries Principal form: SELECT desired attributes FROM tuple variables –– range over relations WHERE condition about tuple variables; Running example. Tallahassee, Florida, 2014 COP4710 Database Systems Relational Model Fall 2014. 1–1 Students Entity/Relationship Model Diagrams to represent designs. Entity like object, = “thing.” Entity set like class = set of “similar” entities/objects. CSCI 305 – Fall 2013 The Entity-Relationship Model Based on Slides by Prof. Brian King. 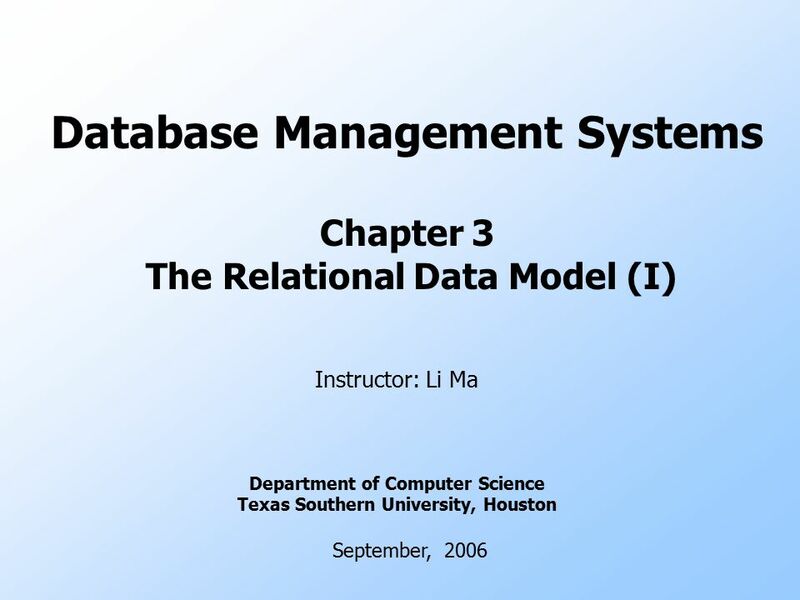 Database Management Systems Chapter 3 The Relational Data Model (II) Instructor: Li Ma Department of Computer Science Texas Southern University, Houston. 1 Entity-Relationship Model Diagrams Class hierarchies Weak entity sets. 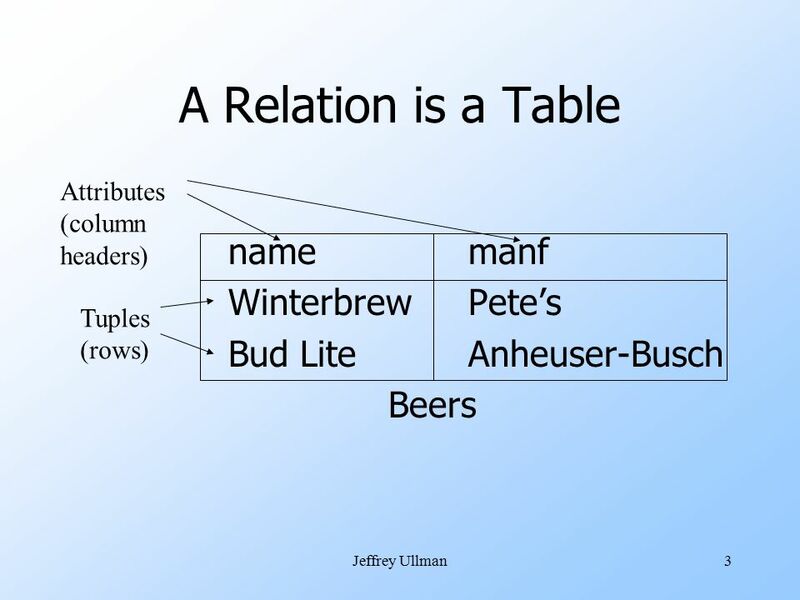 1 Convert E/R to Relation May 18, Entity Set -> Relation Relation: Beers(name, manf) Beers name manf. 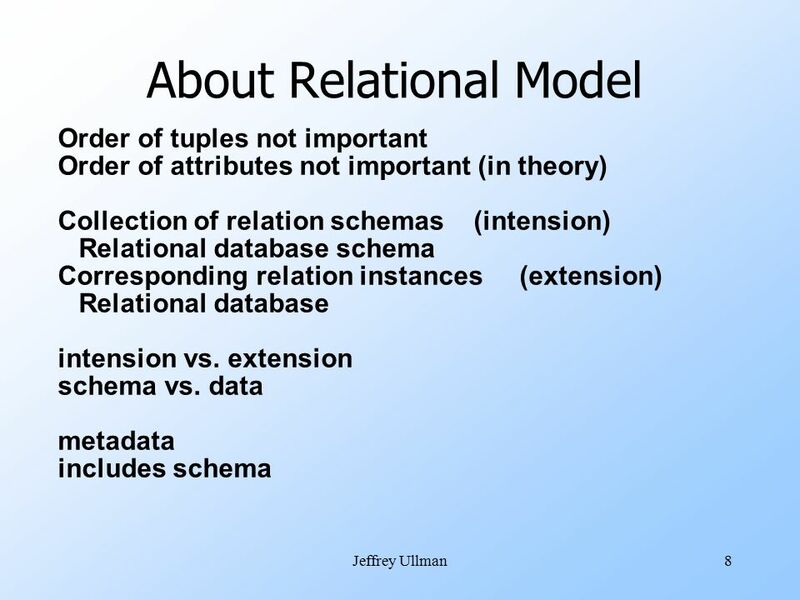 Databases : Relational Model 2007, Fall Pusan National University Ki-Joune Li These slides are made from the materials that Prof. Jeffrey D. Ullman distributes. Chapter 4 Notes. 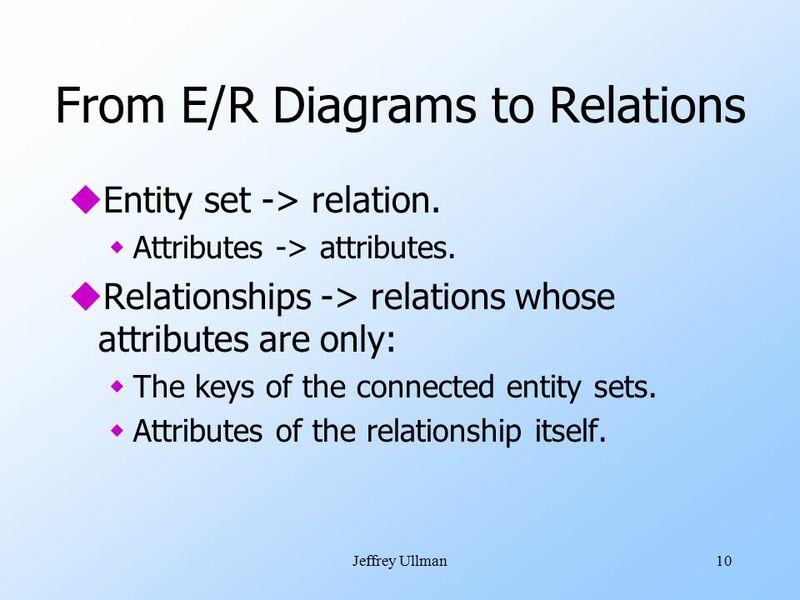 Entity-Relationship Model E/R Diagrams Weak Entity Sets Converting E/R Diagrams to Relations. 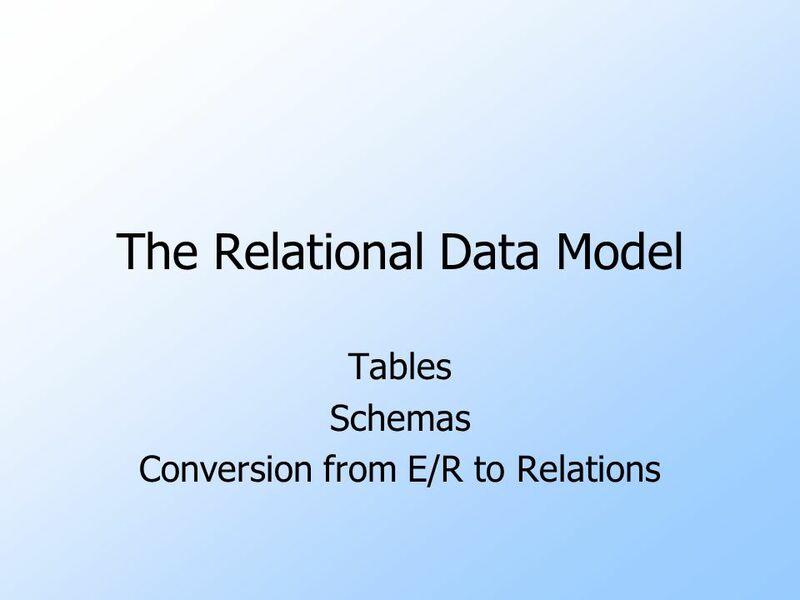 1 Relational Model and Translating ER into Relational. 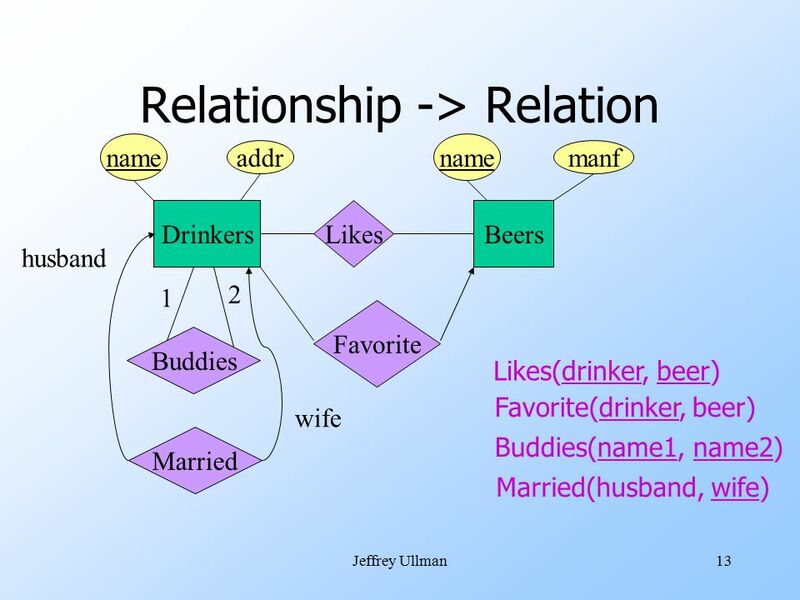 1 Entity-Relationship Model Slides by Jeffrey Ullman Modified by J. Welch to replace beers with candies.